Monica Takvam is a visual artist and photographer living and working in London. Monica’s interests, as a photographer, may be obvious. She is interested in seeing. 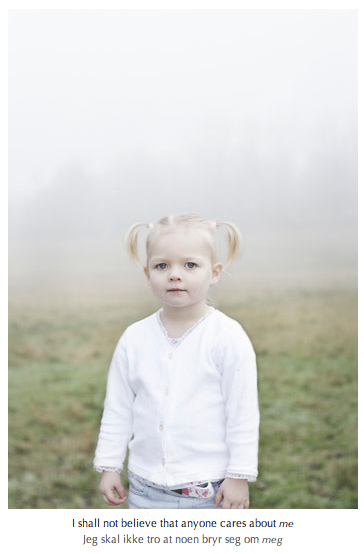 However her exploration of what it means to ‘see’ goes much deeper than most people who use a camera. Her approach to research is done in a reflective and thoughtful manner, often in collaboration with her subjects. Her work probes issues of solitude and detachment. She explores how people see themselves or others, how communities see people and how individuals are positioned, or restrained within those structures. In her search for what it means to see she has become interested in the inability to see physically; in those who are blind. When the most dominant sense is removed much is revealed about seeing. By following her early fears and fascinations, photography and a fear of losing her sight, she has come to build a personal body of work that continues to delve into the complex understanding of perception and what it really means to see and be seen. Monica’s work has been shown in exhibitions throughout England and Norway, including NorskArt, LaViande Gallery, London 2007 and DogA, Oslo 2007; Essence, Beldam Gallery, London 2008; solo-exhibition at Menier Gallery, London 2009; Reports from an Ordinary Satellite, Birmingham 2010; Test, London 2012; New Form (part of Photomonth festival), London 2012 and Photography and the Contemporary Imaginary, London College of Communication, 2013. 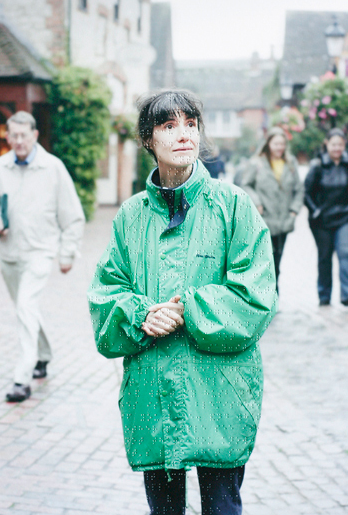 She has been shortlisted for the award This Working Life, and was exhibited at the AOP gallery in London, Liverpool and Manchester, and has just had her photographs featured in the Exposure 2013 exhibition in New York. 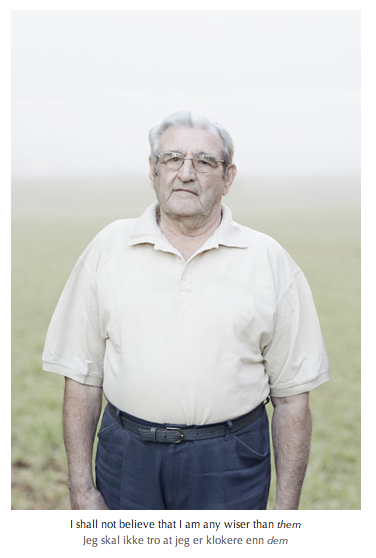 Monica received honourable mentions in two categories for the work ‘Janteloven – Small Town Mentality’ in the IPA – International Photography Award. This body of work was also featured in Portfolio Catalogue issue #47. In addition to her artist practice, Monica is assistant editor at Photography and Culture and research affiliate at UCA. She is also involved in curating exhibitions and organising talks and workshops. How we see ourselves, others and how the camera sees us are prevalent issues in your work. How would you describe your interest in seeing? How does photography as a medium help you to express this? I have been interested in photography since I was a child, and always very curious and questioning. For a photographer, eyesight is arguably the most important sense and I’ve always been terrified of losing my ability to see. I am also very fascinated with how sight works, and how we see and perceive people and all things around us. I felt it was completely natural and necessary for me to deal with my questions about seeing through my work, and to explore photography as a mechanism for seeing. I have been concerned with the relationships between identity, self-perception and physical perception since I was a student, and it is something I’m still researching and making work about. In my work ‘See You See Me’ (which has several parts to it) I’m considering the exploration of questions specific to how we see other people and ourselves. I needed to research the scientific side of perception, sight and the brain in order that I could carry out my photographic practice and understand what I was looking at. The core theme of perception uncovers a dependency between the thing perceived and the means of perceiving it, which I find interesting. How does blindness fit in here? What have you learnt about ‘seeing’ as you have researched and worked with blind people? Exploring blindness became a very natural fit in my project. In order to understand sight and how we see, I really needed to explore blindness and lack of the seeing sense. I’m intrigued by loss of sight, and I’ve always thought a lot about how fragile our eyesight is. What replaces it when it’s not there and to what extent do we see with our minds? 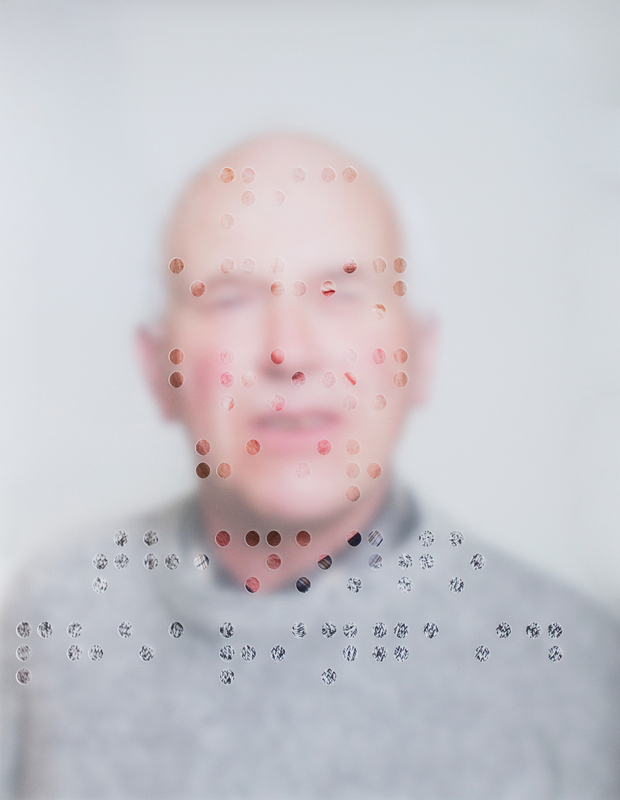 My work to date has juxtaposed the visual medium of photography with non-visual information sources, including audio and Braille, to question what identity means to those who describe themselves as blind and those who experience them as individuals. Through my research and from working with blind and visually impaired people, I have learned so much about how our perception works. An incredible amount of what we ‘see’ is perceived through a combination of impressions from all senses, but sight is the clear dominant sense. It makes me feel extremely humble to work with someone who ostensibly faces so many challenges in not being able to see the world or the people around them, and yet in reality they can teach us how to really see, perceive and listen to our surroundings. A woman I’ve worked with told me about how she became blind overnight, she woke up totally blind one morning. Now she obviously has do deal with our extremely visual-based world in a completely new way. To try to understand how that’s like is quite overwhelming. 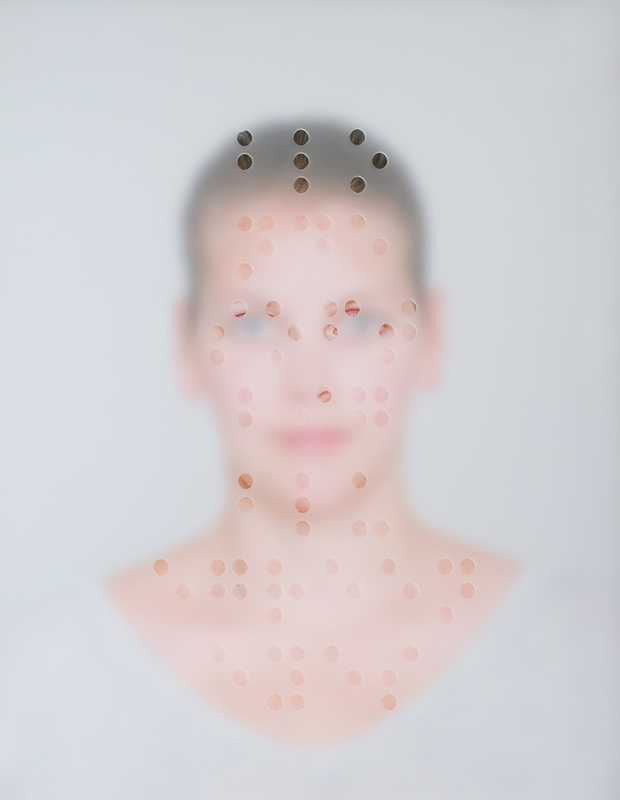 Can you tell us more about the Braille in the images? Is the print actually raised? Is it how the subjects answered after you asked them how they see themselves? I had to learn Braille for this project, and I’ve inscribed all the prints by hand (with the tip of some kind of home-made knitting stick invention). So I’m now pretty good at reading and writing Braille, although I need to practice my by-touch-only reading. The series has been shown with sound, by each portrait there’s a pair of headphones where you can listen to the person’s description of himself/herself. Voice is also such an important factor in perceiving someone, something I’ve perhaps become even more aware of now, after working on this project. In my new body of work I’ve focused on the face and the close-up portrait, and the idea of not seeing in photography. I’m making the photograph less visible and the surface-information less tactile, less accessible. There are no headphones to listen to either. I guess it becomes a little more unreachable for both people who can see and those who can’t, but the merge makes a new impression and question all together. In parallel with these photographs, I’ve also been making some tactile sound-devices. I started just exploring tactile sound, devices that activates when you touch them, and the sound on these are very ‘abstract’ rather than melodic. It made me consider language in a way I hadn’t before, and I’ve experimented with ‘translating’ bits of text into Braille, and then into musical notes. You end up with a melody language no-one (or everyone) can understand. Are the images your interpretation of their words or an expression of how you see them? A photograph taken by someone of someone else will inevitably always be an expression of how the person behind the camera sees them, to some degree or another. I guess I was less concerned with making an active analysis of the people I photographed; I very rarely feel it is about my view or conscious interpretation of them. I am just genuinely interested in how we perceive people and how we describe ourself, and my portraits in that series were (I hope) my records of them on that particular day, with my emotional response in there, of course. In Janteloven you explore small town mentality, which can operate to make people feel inferior and act as a vehicle of suppression. Is this something you encountered in your own background? If so, how has it impacted you as the photographer you are today? I was very interested in exploring this social phenomena, and very specific collective mentality, but from a more ‘observational’ point of view. I never grew up feeling this extreme suppression; I had a good childhood and have always had loving, encouraging parents, but I think you will have had to encounter this way of thinking at some point in order to respond to it. I have of course met ‘them’ at different points in my life. Some places in the world nurture an attitude of self-oppression; that you should not think you’re better than others, or that you know more than anyone else, which in moderate forms I’m sure is done with good intentions. However, what I was interested in exploring is how, where and why it can go as far as to give an extreme crippling feeling and be de-motivating to the individual to the point it suppresses uniqueness and desire for any change. Through all my research and exploration, I can now see a link between some of my core interests of perception and seeing, and self-perception and personal memories. At the moment I’m also working on a conference and exhibition exploring nostalgia, and from researching this topic I’ve become more aware of how much a resentment for uniqueness and something new can also be rooted in deep nostalgia for ‘how things used to be’, which some societies feel more strongly about protecting than others. However, it’s never that simple. For me it is a constant area of research and reflection and I love dealing with these questions through my work. What do you hope to achieve in highlighting this important issue? I guess I didn’t initially aim for it to change or achieve anything when first making these, it was an issue I felt like I needed to question, deal with, tear apart, put together again and explore through my images, and people who encounter my images are welcome to make up their thoughts and interpretations. But I do often hope that my photograph and the topics I explore might resonate with someone, and that some people might connect with the work. If you react to photographs you see in some way, so that you either question or reflect or have an internal emotional response to them, the project must have done something good. You are involved in many roles; editing, organising, researching, practicing. What’s the best part about being a photographer for you? One of the best parts of being a photographer is being able to work on many diverse projects, meeting different people all over the world and working with something I’m passionate about. It’s a mode of work and expression that feels completely natural. I love photography and being able to create work is important to me. I feel fortunate to spend my days making or looking at images, editing images or talking about images. In addition to being a photographer, I also work with organising and curating exhibitions, talks and workshops, and I work with a journal called ‘Photography & Culture’. Working with writing and research around visual art is a large part of what I do, so I am able to work with photography, in some form or another, all of the time. I feel a strong need to make photographs. To work with photography was never a career choice in that sense; I just always knew I needed to do this.